Offering far more than the average dip, our two restorative pools are the heart and soul of Indian Springs Calistoga. Since the 19th century, guests have come to our resort to experience the therapeutic and healing properties of our natural thermal pool. Our popular Main Pool is an Olympic-sized mineral pool built in 1913, and one of the largest pools in California. The Adult Pool is smaller, quieter, and more intimate—and kept at a cooler temperature than our mineral pool. Add a revitalizing element to your swimming experience and immerse yourself in the pools—open until midnight for our hotel guests to allow you to soak it all in as you float under the Napa Valley stars. As the center of Indian Springs Calistoga life, The Pool is often a place of whimsical touches. You never know what will appear, such as the ever-popular yellow rubber duckies. To quench your thirst and appetite, pool snacks, wine and beer, and chilled drinks are available poolside. Our pool menu offers special items from Sam's and we have lots of tempting grab and go items. Additionally, no outside food, drink or glassware is permitted. Don’t forget your swimsuit. A visit isn’t complete without a soak in the historic, Olympic-sized mineral pool. Built in 1913, the pool replaced the original 19th-century “plunge” and now welcomes guests of all ages to experience the health and spiritual benefits of the rich, highly mineralized water from our geysers. Our Adult Pool is smaller, more intimate and, yes, a little quieter. The Adult Pool allows grownups to relax in a sophisticated setting. The lush landscaping adds privacy, while its night lighting inspires evening swims. 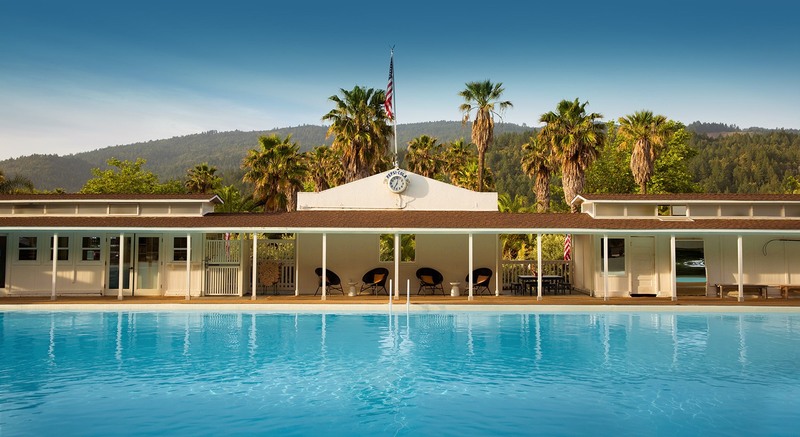 Very few sites in the country have access to such a bountiful source of thermal mineral water, and guests of Indian Springs Calistoga can soak up its benefits year-round.